Tagged under Puella Magi Madoka Magica, Short Hair, Blue Hair, Blue Eyes, Waifu. 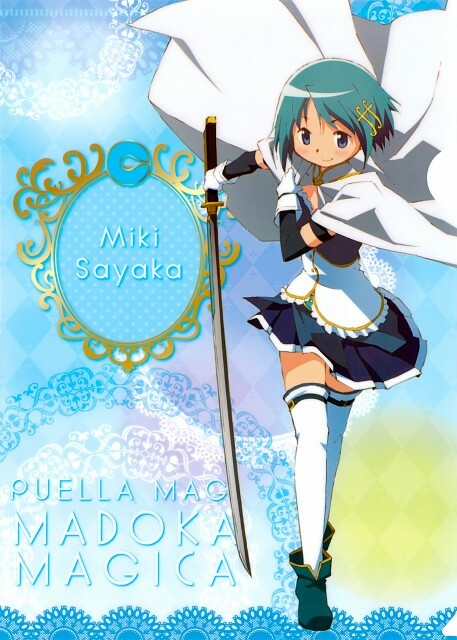 Sayaka is a cheerful, slightly tomboyish middle school student who usually hangs out with Madoka Kaname and Hitomi Shizuki. She visits her friend, Kyousuke Kamijou, in the hospital quite often, and has a one-sided crush on him. Witnessing his breakdown, Sayaka accepts Kyubey's offer and enters the world of magical girls with a burning desire to save lives. However, this confidence diminishes as she begins comparing herself unfavorably to the more powerful and talented magical girls she encounters. After the contract is made, Kyubey leaves Madoka and accompanies Sayaka instead.